Drumsticks are another name for the lower portion of chicken or turkey legs. Some people prefer the drumstick to the white meat of poultry because it offers more taste and dries out less quickly. Seasoning and avoiding overcooking are really the keys to perfectly preparing this dark meat. Using a meat thermometer and cooking the meat in a pan with a liquid will ensure it cooks evenly to a safe temperature while retaining its moisture. Rinse the meat well under cold, running water. Pat the meat dry with paper towels. Season the outside of the meat liberally with the seasonings of your choice. Bring 4 tbsp. of oil to medium-high heat in a large skillet. 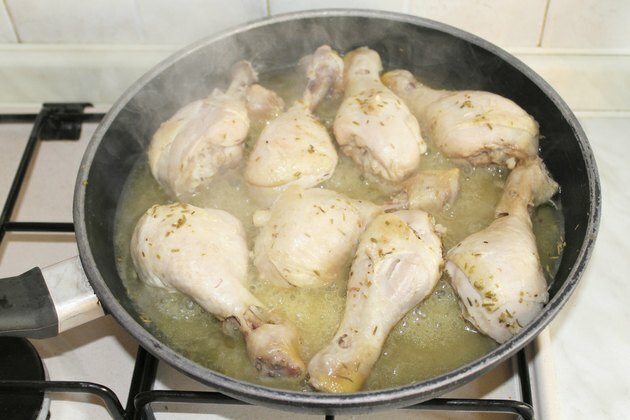 Place your seasoned drumsticks in the oil with the meatiest part of the leg facing the center of the skillet. Cook the drumsticks for 5 minutes on each side, browning the outside of the meat all the way around. Pour 2 cups of chicken stock in the pan with the drumsticks. Place the lid on the pan. Cook the drumsticks for 30 minutes to an hour, depending on the type of bird. Remove the lid from the pan and insert the meat thermometer in the thickest part of the meat, making sure you are not hitting bone or the bottom of the skillet. Remove the meat from the heat once the temperature has reached 160 F.
Omit the oil and use barbecue sauce as the braising liquid for a tangy variation. Check each drumstick individually for doneness before serving.